There is a small beach town near my hometown which has become a favourite. It is a little known beach enroute to a more popular destination where the surf is great and restaurants, coffee shops and the Aussie fish and chips shops abound. The beach of this small town is small and exposed, the wind can leave you housebound for the weekend and there is a one and only eatery at the one and only pub. It may not be a typical Aussie beach destination for the Summer holidays, but the quirkiness, rawness and the memories associated with this little place are what embed it in my heart as a special place. The feeling of having discovered a gem stays with me; the memory of arriving without any expectations and discovering a paradise. You won’t find postcards of this place. 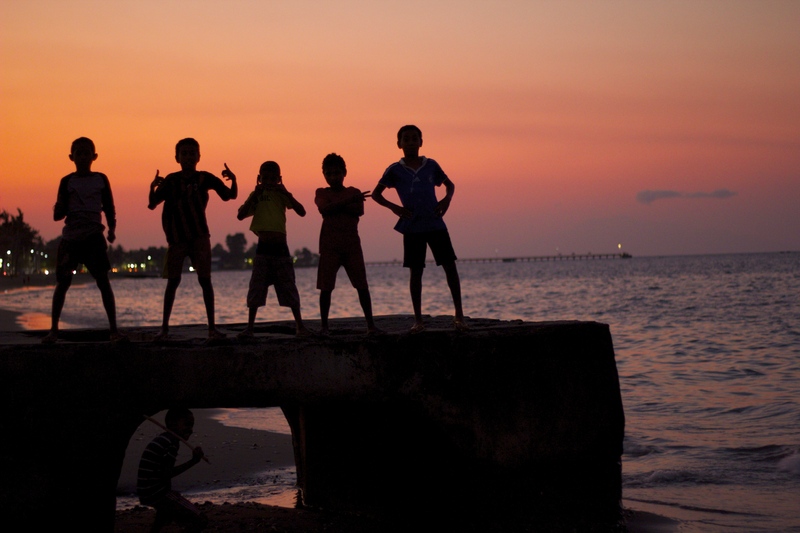 Timor Leste is for many people, not a destination, but a means to an end. It also has a bloody history of colonialization,invasion and the unfortunate Balibo event. For us, Timor Leste was the jumping off point from Australia, the closest country for us to ship our bikes and to access the exotics of SE Asia. To many Overlanders, it is the source of frustration as weeks are spent waiting for the bikes to either arrive from or in Darwin and to be cleared by Customs. Tales and blogs abound of delayed shipping schedules, custom bungling,incompetence and blown out prices. Travellers are frustrated by the lengthy stalling of processes in Dili coupled with the uncertainty of when exactly the bikes will arrive, in what condition and deciphering confusing shipping jargon. Usually, the bungling is blamed upon the local shipping company and Timorese Customs. 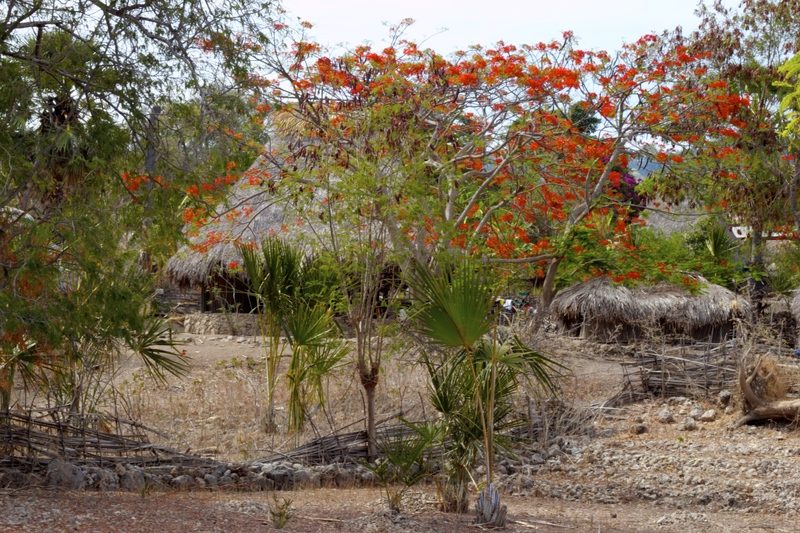 Consequently, once the motorbikes do finally arrive, sometimes after three weeks, most Overlanders are impatient to take off west, leaving Timor Leste in their wake. Another hurdle faced in Dili is the Indonesian visa application which needs to be completed in readiness for the first land border crossing.This too has its own protocols and officiousness which we were soon to discover. Some of the above comments are true, some are exaggerations, some are peppered with truth, some are based on fear and I still don’t understand why their coffee isn’t on Australian shelves! If it is, please try it as it is delicious and unique. Kopi Susu! After just a week,Timor is now, for both of us, that raw and quirky favourite holiday destination. It is not the war zone it is depicted as, in fact it is incredibly peaceful and safe. Within its chaos can be found paradisiacal beaches, rugged mountains, welcoming villages, exotic foods and proud people who find joy in the simplest of daily activities, especially ours! We spent our first three days in Dili organising our Indonesian visas and so took accommodation near the Indonesian Embassy (Embassie De Indonesie) via good ol’ Air BnB. Our room was part of staff quarters at one of the Diving Centres in Dili, which seems to be the only thriving tourist industry operating over here. 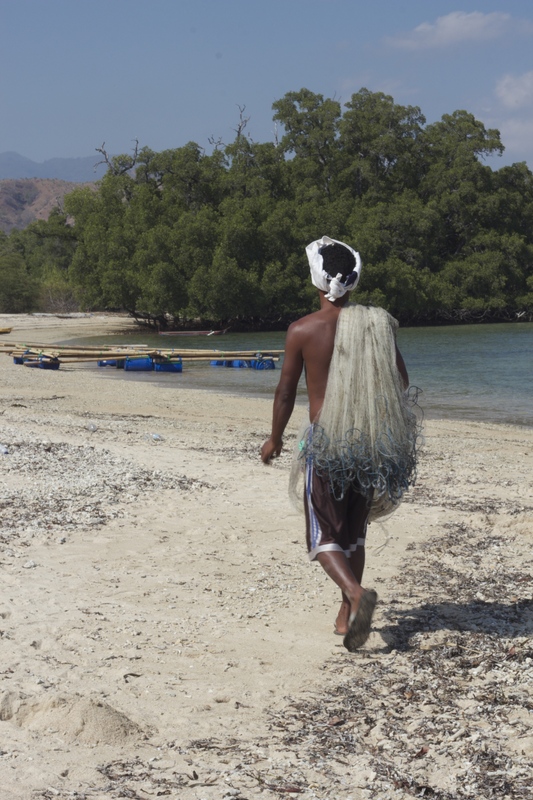 Timor is part of The Coral Triangle and diving is meant to be world class as is snorkelling. Dive Timor is across the road directly from the port where we could see a number of ships tantalising us. Somewhere out there was The Reliance with our bikes. It was due in on the 30th and we had arrived on the 28th. Yes the dates had changed a few times, but now we were back to the original date of arrival. Arrival does not mean unload however, as the ships wait in port for their turn to unload. 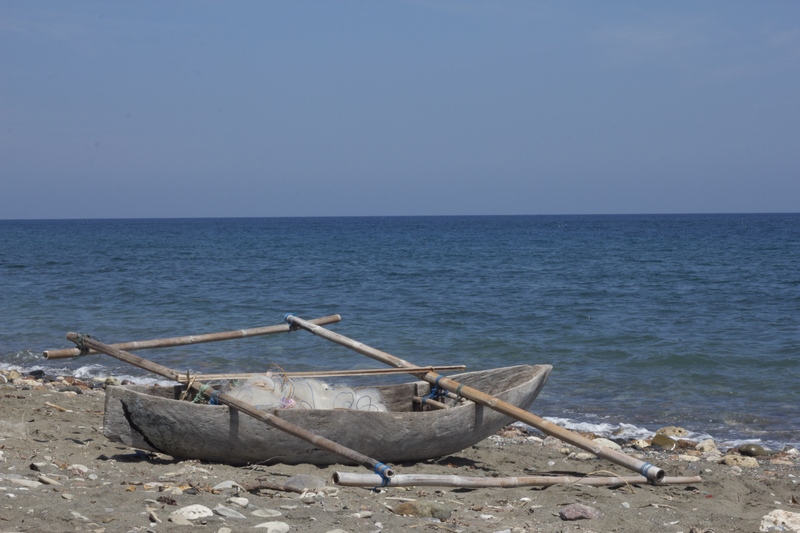 The port is also home to a beach where the coloured wooden outrigger fishing boats are left just lying on the sand. It is a beautiful beach which extends for kilometres and where people jog and walk along at dusk. Children and families come to swim there when the tide is low, jumping off the rocks and the little brown bodies are usually nudey! Men arrive with home made wheelbarrows carrying their motors and fishing nets. It is here I came to know the friendliness of the children, their excitement at having their photos taken and their genuine interest in us. We were obviously a novelty and they tried to communicate even though most of them had little English. A group of young boys kept saying ‘one more’ as they would line up, follow my directions and laugh and smile at seeing themselves in the photos. Even the men thanked me for photographing them and were willing models.The boys asked if I would be there the following day, so I said yes. The next day I found a photo printing lab and printed seven photos for each of the boys. I had read recently that many of these people in third world countries have no photographic history of their friends nor family and so I wanted to gift these boys a memory of their friendship. At dusk I waited for the group and there was one boy already waiting for me. He saw the photos and with a big grin, pointed to himself. Then two more arrived jumping with excitement. I asked them to write their names for me on the back of a spare photo and they did so carefully and in their best writing. All of the boys finally arrived and after much laughing and jumping around they each grabbed my hand, brought it to their forehead and then kissed it. Such a simple act had brought so much joy to these boys and I am sure the photos all have a special place in their homes. Imagine what a Polaroid could do! Being without wheels is like being without legs and getting around a hot dusty city is not much fun this way. However, we managed a few site seeing jaunts, trips to the Post Office and essential shopping whilst waiting for our visas to be processed. The visa application process can be frustrating and problematic, but we were forearmed with instructions as to how to expedite the process as painlessly as possible. It’s like Monopoly, play the wrong card and you go back one space. We managed to play the correct cards and so 3 days later we had our 30 day visas in our eager hands! So on Friday at 2.00 pm we received our visas for Indonesia and felt pretty smug that we would receive our bikes from Customs as we had been told that the ship had docked. Hence, we taxied it out to TOLL Holdings where our bikes would be delivered, to pay some handling and Customs fees before heading back to Customs at the Port to have our Carnet De Passages stamped into Timor Leste. Having completed this, we waited that afternoon for a call to collect our bikes, but we were instead informed that it was a half day Public Holiday, something to do with honouring the dead they said!! Resigned to the fact that the weekend would be without our bikes we hired yet another scooter, but only one this time with the view to saving money. 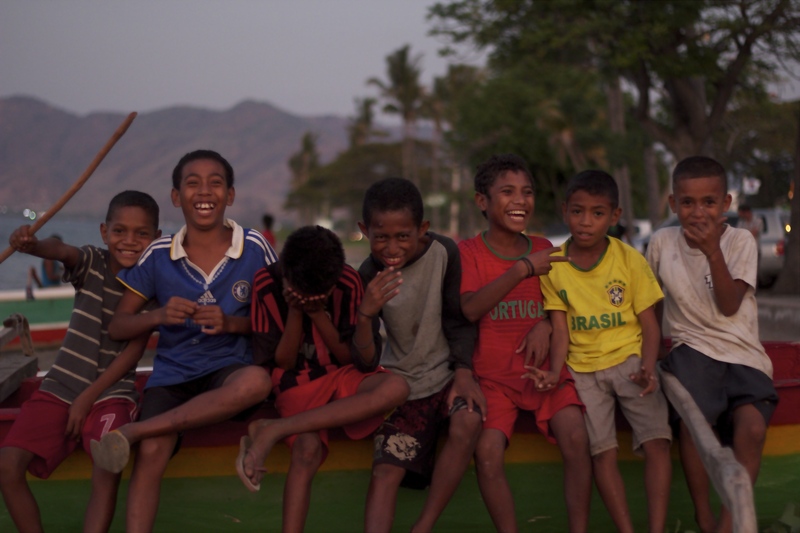 That afternoon with our new wheels we began exploring Dili and that is when we really began falling in love with the place. We found little dirt roads on the outskirts where people lived in little stone huts and children played in the streets. We also rode up to the famous Jesus Christ statue donated by the Indonesians when they occupied the country. Around Dili we also saw many, many people carrying water containers around. I assumed this was because they didn’t have running water, but I should know better than to make such rash assumptions. All Saints day is on November 1 and All Souls Day on November 2nd. We had stumbled upon the famous Santa Cruz cemetery where a massacre by the Indonesian military had taken place in 1991. (This event helped to bring the Indonesian occupation and cruelties to international attention). Hundreds of people had come to honour their dead ancestors by washing, painting, sweeping and leaving flowers on their family graves. Police were present to control parking and traffic, so we had a quick look and left. This is the public holiday that had held up our bikes in Customs for the weekend. However, I then remembered that this same week, many people in Victoria had a Public Holiday for a horse race! How easy it is to judge other people’s customs and rituals, especially when we don’t understand them. There is a lot more to be said for community and family values inherent in tending family grave sites than having a holiday for a horse race. More interesting is that family graves can be found built into hut verandahs with children sitting on it or washing hanging over it. I guess grandma and grandpa never are never forgotten! Little did we know that this holiday carried on to the following Monday which meant again that Customs wasn’t working. However, by then we were more than happy in the paradise we had found by travelling eastwards for a mere 120kms along the coast on our little scooter, a donkey to do a horse’s work. To Baucau we were bound and a change in attitude. The condition of roads is in the eye of the beholder. 120kms took us four hours along a twisty and at times, rough road over headlands which provided amazing vistas out to sea. We felt like we were in the last frontier as we travelled through traditional villages where pigs, goats, chickens, goats buffalo and people were all over the road. Children ran out to wave to us. Along the way we had met a local couple on their scooter who had recommended we stop at the rest stop ahead for some local fish. Still quite unsure of the fish on sticks, we agreed to meet them there. What a treat it was. These rest stops on the sea front, are Government built open air “restaurants” where the Ikan (fish) and Mayam (Chicken) are cooked on an open fire in little huts just behind. They are served up with steamed rice, which is served in woven palm leaves in the shape of a small package. How delicious they are and so now if we see such a place, with the best of beach views, we stop for a meal, even if it is breakfast time. We had no sooner said goodbye to our lunch time friends when we met another interesting person in Baucua, our destination. Tony, an Australian volunteer working at the local Tech School offered us accommodation in the local Presbytery for a donation. So off we went to stay with the local Padre and challenge him to a game of scrabble. The art of dugout canoes is alive here! 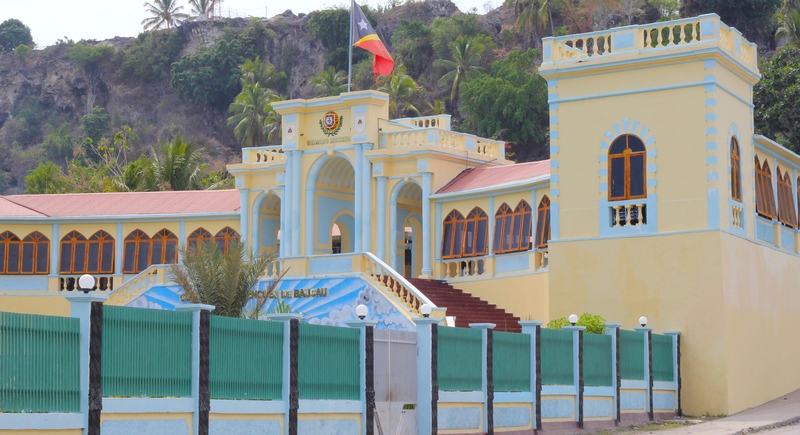 Baucau is the original capital of East Timor and still has Portugese influences from the colonialization of the country. The old town has Portugese architectural influences and the old fort by the sea reminds you of the difficult times this country has faced. 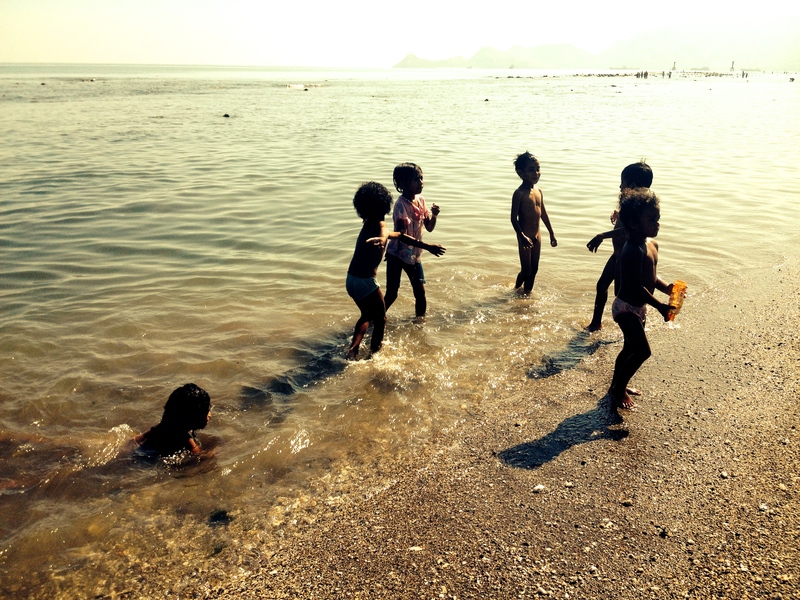 It also offers reprieve from the heat of Dili with the sea breeze, the Leste. Ever since leaving Dili we have had a succession of people wanting to help us long the way, from lunch by the sea to the Presbytery accommodation and then to a special lunch invitation with a local family celebrating All Souls Day. 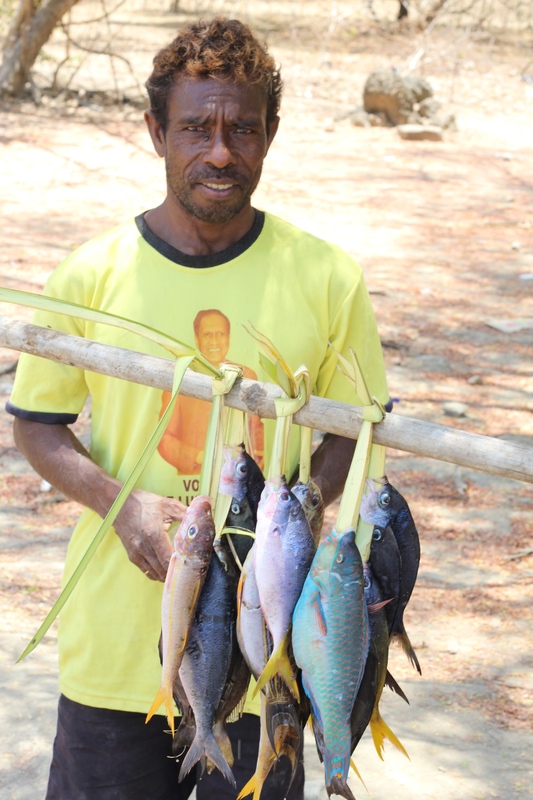 In the city of Coral ( Timor is a new country which was pushed up out of the sea and so is largely made up of coral formations) we trekked to the family house where we were treated to amazing hospitality and an especially killed chicken for the lunch. The young men of the family enjoyed practising their English and talked of their dreams of going to University upon finishing their final year of High School. They were very intent upon this goal and left us wondering how we could help fund this dream. Families are poor and often sacrifice much to send family members to Uni. After two nights in the cool retreat of Baucau, we returned via the same road back To Dili to wait for the bikes yet again. Monday was another public holiday because of All Souls Day, but on Tuesday we finally received the call to say they were cleared by Customs. The next day we were excited to continue our adventure on our own motorbikes and headed west towards the border of Timor Leste and West Timor. Pot holes and windy roads were yet again in front of us, but we didn’t care as we had our own wheels! The hospitality continued as we reached a small village on The Loes River. The first rain we had seen since leaving Australia descended upon us so we decided to find a guest house. Of course unless you are in a town as opposed to a village, there is no accommodation to be found. We had hoped to camp, but the locals reminded us about the crocodiles and advised against it. The crocodiles seem to be a mystery, as in Baucau, the locals told us that the crocodiles live happily with the people and no-one gets eaten! Heeding the advice in Loes, we decided against camping and once again were blessed with another serendipitous meeting with a man who invited us to stay with his family. so of we followed him approximately 5 kms deeper into the village to meet his family which lived in a very simple house. The whole family slowly gathered through the late afternoon to meet these visitors wit whom they could barely communicate. The language section of our Lonely Planet guide came in handy for the basic words and was the centre of attention for a few hours. We also felt that books generally are a novelty as the family huddled around trying to read it. 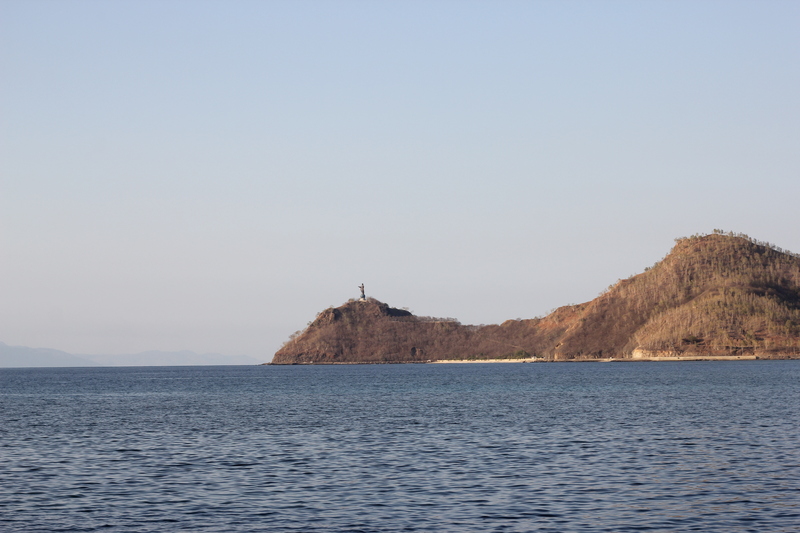 Once again , we felt that we were being passed from one friendly person to the next as we traversed Timor Leste. little did we know that this experience was to continue into Timor West as well. Balibo, the site of the bloody murder of five men working for Channel 7 and 9 in 1975, was our next stop. We had made a point of making this pilgrimage, given the work of journos, cameramen and sound technicians were paramount in getting the word out to the world about the atrocities of Indonesia’s military in trying to quell Timor Leste’s vote for independence. It was a moving experience to see the flag that Australian, Greg Shackelton, had begun to paint in the naieve attempt to let the the militia know that Aussies, Brits and NZers were inside the house. They believed that the militia would bypass them, but they were executed and their bodies blown up. 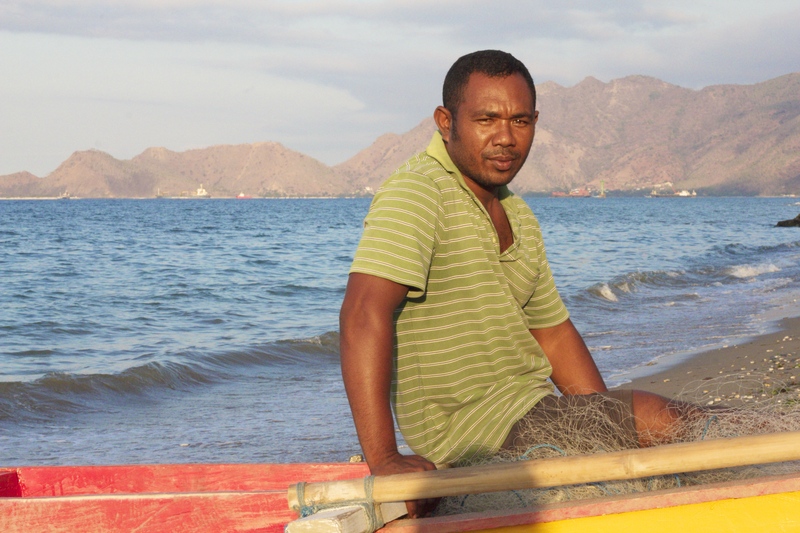 Sadly, another Australian was also executed in Dili around the same time. 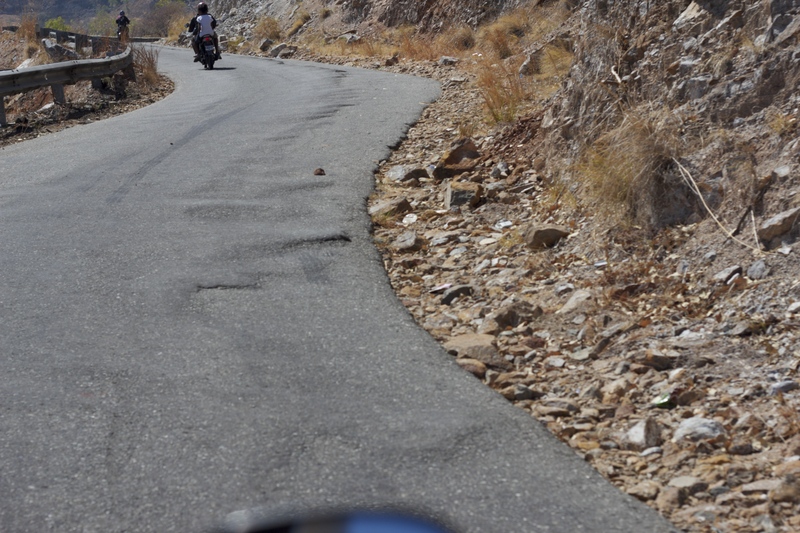 Timor Leste is indeed a third world country, where infrastructure is almost non-existent. Poor skills in plumbing means that bathrooms inevitably have either a water or drainage problem, sometimes both. It may seem like the country has been locked into a time warp where broken down tractors are abandoned and roads are bitumized by hand. The truth though is that it has long suffered at the hands of its rulers/conquerors. Portugal saw it as an outpost of the spice trade routes and is said to have provided little in terms of development and infrastructure. Similarly, Indonesia invaded the country in 1975, parachuting troops in by air and slaughtering locals. After 24 years of rule, a referendum was held which resulted in a vote for independence. The fight for independence was bloody, but it is also said that as they left, the Indonesians ripped out power lines, burnt houses, possibly even ripped up roads and herded people west across the border. The reality is that this peaceful and friendly country has been struggling to build itself since the Indonesians left with a bitter hand of revenge. The people may lack the skills to build the necessary infrastructures, but as we witnessed.education is highly valued and the average villager will work hard to ensure their children gain further education no matter how much it may cost the family. Having traversed just a small part of this little country, we learnt of the impact of colonialization and invasion, but experienced first hand the resilience of the spirit of the people. Development will be slow, but in the meantime, as travellers we experienced traditional family and community life and feel privileged to have done so. And their coffee is awesome! Hi we have enjoyed reading g about your travels in timor lester. We are planning on doing a ride there in June/July this year. Our plan is to hire a couple of bikes. Did you have any issues buying fuel? Was it readily available?